Willem Dafoe compares his time on Aquaman to Sam Raimi’s Spider-Man movies. Patty Jenkins teases a “full-blown” Diana for Wonder Woman 2. Get a new look at Luke Skywalker in Star Wars: The Last Jedi. Plus, new footage from Mr. Robot’s next season, and teases for the returning DC/CW-verse shows. To me, my spoilers! Screenwriters Chris McKenna and Erik Sommers are in final negotiations to return for the sequel, according to THR. [James Wan’s] enthusiasm is fantastic. In fact, his enthusiasm reminds me, very much, of Sam Raimi’s enthusiasm, to make a connection there. When I made Spider-Man with Sam Raimi, one of the most impressive things was that it didn’t feel like an industry film. It felt like a personal film. It felt like Sam Raimi was getting to fulfill a fantasy of his. He was so connected to that Spider-Man mythology that he really infused it with great love and great playfulness, and I love that. James Wan is very similar. Patty Jenkins promised the sequel will feature the “grand” and “full-blown” Wonder Woman of the comics. The greatest thing about making this [the first Wonder Woman] movie was the fact that you’re really building to the Wonder Woman that we all love, but not until the end of the movie. The most exciting thing about [the sequel] is literally seeing her loose in the world now, living those classic stories. Here’s Wonder Woman, and what can she do? It should be a totally different movie, but a grand and now full-blown Wonder Woman in the world. A new photo of Mark Hamill looking badass has made the cover of the Hungarian movie magazine, Mozimania. A set of character posters have been added to the film’s Twitter. Here are three character posters from the biopic about the creator of Wonder Woman. Stephen King is shocked to learn just how good the new It movie is in this featurette from Yahoo! Movies. Here’s a quick teaser for Alexander Payne’s all-star scifi movie, starring Matt Damon, Christoph Waltz, Hong Chau, Jason Sudekis, and Kristin Wiig as volunteers in an experiment to reduce their carbon footprint by shrinking themselves to four inches tall. Gordon fears Jonathan Crane (guest star Charlie Tahan) is still alive and back in Gotham, when the Scarecrow’s signature MO is used in a series of robberies. Meanwhile, Penguin’s “licensing” of crime in the city backfires during the grand opening of his new Iceberg Lounge. Also, in the aftermath of his encounter with Ra’s Al Ghul, Bruce begins his vigilante watch. Here are the producer’s previews of the DC/CW-verse shows seen during last night’s Vixen: The Movie. We also one for The Flash. And here’s a third promoting all four. 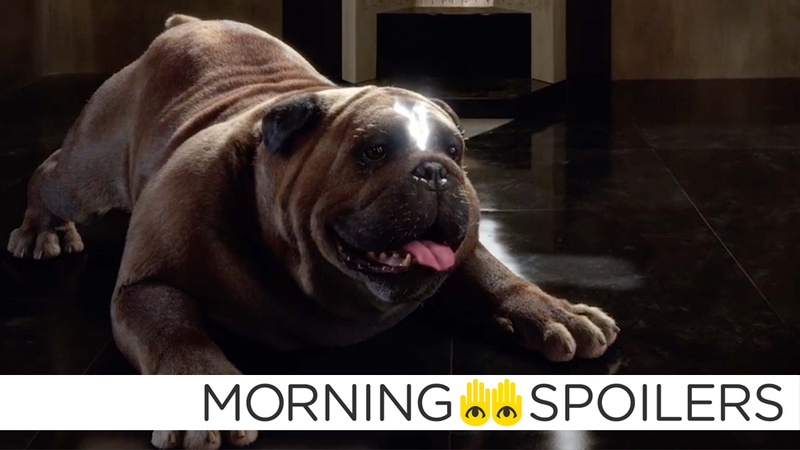 The latest advert for the series examines the process of Terrigenesis, the method with which Inhumans transform and gain their superhuman powers. Meanwhile, here’s a making of featurette for the series, courtesy of IMAX, which means it’s mostly people fawning over the IMAX format. Finally, the Dark Army strikes back in a new trailer for Mr. Robot’s third season.